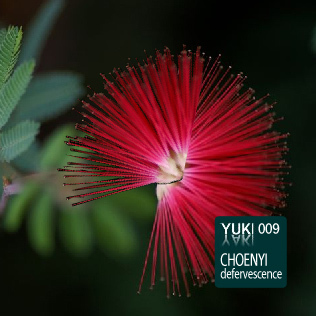 Choenyi kicks off his Yuki Yaki debut with a 6-track EP. This is his third appearance after the remix on YkYk008 and his compilation track on YkYk005. He has created cold and dark tracks oscillating between Minimal Techno and Soundscapes. Profound beats are playing a main part in the conception of the tracks. The swinging "Doma Fourth" and the stomping hymn "Tri Ling" can be located near Dance floor music. Spheric helicopter flights through a dark night. Choenyi's other issue is Dub. He has made it up of little, reduced reverb-rooms and the selective use of delays. No element is being pushed in front and klicking drums leave a lot of room for the dark dub of choenyi. The remixers took a certain element of the track and moved it in to the fore. Lao and Nicolas Aguero aka Sumergido pushes "Pollen" more into the classical Dub scheme. Daniel Carew changed "Doma Fourth" into a dreamy and happy tune. Manziping puts some extra funk to "Mime Dub", making it ready for peaktime dance floor. Last but not least Dr. Nojoke use samples from "Pollen", "Taurean Storm", "Tri Ling" and "Monophase" to create his "Defervescence"-extract. Choenyi is a medical language specialist residing in the Southern Appalachian mountains who believes that all sound is inherently psychoacoustic - and that electronic sound generation and manipulation is an excellent forum for exploring much of the meaning and implication associable with this assumption. Always, choenyi sought what sounds would next affect him more deeply than that to which he had previously been exposed, starting at an early age with psychedelic rock and American folk and quickly leading through postpunk, industrial, out jazz, neoclassical, and various forms of electronica and avant-garde, eventually absorbing into techno and noise. He has DJed since 1996 and produced electronic music since 1999. Choenyi extends great thanks to all those who have assisted, encouraged, or exacerbated his involvement with music, in particular: Root Elements, DSP, R33F, and Glndr. May all be well. Hey man great release! I will be playing this one out for the Northern Cali heads you can be guaranteed! Very nice and deep.